Begin a legacy in your family today with 100% American made Amish kitchen furniture from Amish Originals. Created in homes and small workshops by Amish craftsmen who know the importance of gathering as a family, our Amish made kitchen furniture is a legacy worthy of passing on from generation to generation. We offer high-quality kitchen furniture built from American hardwoods in a variety of styles. Every meal is special when you gather around a handcrafted table. 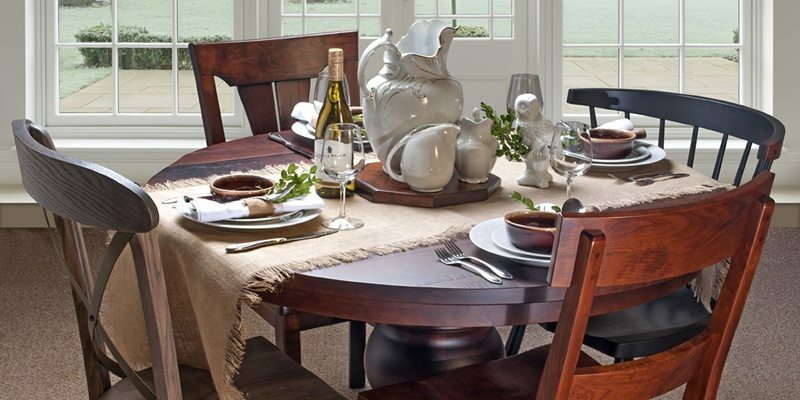 You may be enjoying an intimate meal for two or serving a chaotic holiday feast for 20—either way, you will relish the extraordinary attention to detail and fine craftsmanship that is found on every piece of dining room furniture from Amish Originals. Available in an endless array of styles and colors, your dining table can be accompanied by chairs, barstools, benches, hutches, and sideboards to round out your seating and storage needs. And with the superior protection of our catalyzed varnishes, you can rest easy, knowing that your dining furniture will weather beautifully through generations of life and love. When you purchase your Amish kitchen furniture from Amish Originals, you are helping support local businesses. Working with over 70 local Amish craftsmen in northeast Ohio, our kitchen furniture is high-quality and is made to order in small family shops. Each piece is designed and hand-crafted individually; there are no assembly lines here. When you buy from Amish Originals, you are not only getting functional and durable furniture, you are also getting a work of art.